Here is a new feature for the site—media reviews! Are you so excited? Basically, every so often I will publish a short review on a book, podcast, website, movie, etc. that relates to obsessive compulsive disorder or mental illness in general. Having a sociology background, I really enjoyed Adam’s take on obsessive compulsive disorder. Similar to me, he has dealt with contamination OCD (though his is related to the possibility of having contracted AIDS), and I therefore could relate to Adam’s story very quickly. However, rather than just being a confessional or tell all about his various obsessions and compulsions, he weaves an intense and satisfying amount of research into the narrative, using historical examples of people with OCD as well as how the medical field has attempted to understand, diagnose, and treat the disorder. I found myself particularly enthralled with the life sketches of individuals who dealt with obsessive compulsive disorder in times and places where it was relatively unknown. I feel lucky to live in our society where, while many still don’t understand OCD in its fullness, at least it is a possible diagnosis. Those with OCD are not seen as pariahs or lunatic. We can point to a known mental health condition and associate our symptoms with it. Unfortunately, this was not always the case, and many sufferers of OCD simply had to try and survive. Some were at the whim of new psychology methods, and other simply had to make do with living (or dying) with the OCD in all its horrible glory. While the book delves into many specific aspects relating to OCD, including early treatments (lobotomy, for one), OCPD, types of OCD, childhood OCD, theories of how OCD originates, etc., I found particularly fascinating the discussions on OCD and religion as well as the OCD-brain connection. Adam looks into how the behaviors behind OCD (rituals and obsessions) might be connected to one of the most ancient and primitive parts of the brain. While I won’t go too much into it here, I highly recommend you get the book and read it for yourself—I think it’s important to remember that mental illness is just that—a problem with our brain, not necessarily a deficiency in our moral or spiritual fiber. Speaking of spiritual fiber, Adam’s chapter entitled “The God Obsession,” is an interesting look into how religion connects to OCD. Basically, the implication is that in more religious areas, obsessions relate more to religious ideas or topics. As I’ve mentioned before, the OCD likes to attack where it matters to you personally. If you are religious, it’s highly likely that you may develop religious obsessions or compulsions. If you aren’t very religious, your OCD probably won’t be scrupulosity related. 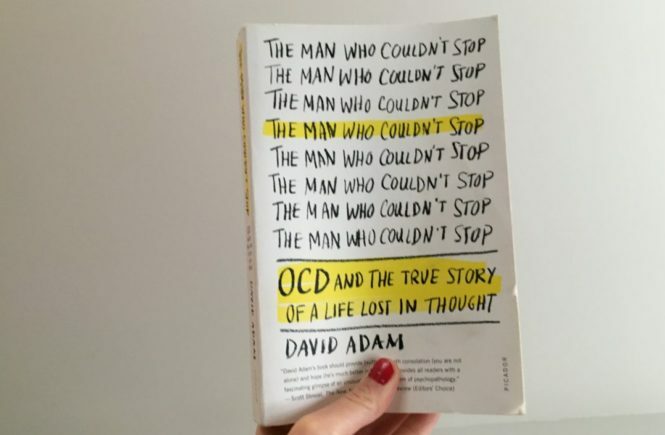 Near the conclusion of the book, Adam’s touches on whether or not OCD can exist on a spectrum: someone being a “little” OCD versus having debilitating, intense OCD. This is something that I’ve been thinking about lately. Adam’s thinks that absolutely, people can have a “little OCD” while others, he says, can’t “turn it off.” For me, I think it’s important to advocate for those who are a lot OCD, those who struggle each day with their obsessions and compulsions. I’ve been there. I may not be there now, but I know I could easily get back there. That’s the thing. I think some people who consider themselves “a little OCD” maybe confuse it with other conditions (i.e. OCPD, perfectionism, being orderly or tidy). It is possible to have OCD and not be encompassed by it—but in my experience, it’s not a personality trait in that case. It’s a tight rope walk. If you allow yourself too many compulsions, if you indulge the obsessions a little too much, you can quickly fall back into the debilitating OCD. So, in a way, having obsessive compulsive disorder is always a part of you. You are either owned by it or taming it so that you can live normally. Overall, I recommend Adam’s book. It is an engaging read and one that helped me understand the history and nature of obsessive compulsive disorder more deeply. It opens up discussion and provides a lot to think about. Go forth and read! Have you read it yet? What did you think?